I first want to thank you all for your patience and continuing to follow along with the blog. There has been a lot going on recently on the personal front so I have had to put some things on the back burner. However, we are ready to start writing again and are looking forward to sharing some cool things with you all. I promise I will keep this week short so let’s dive right in. 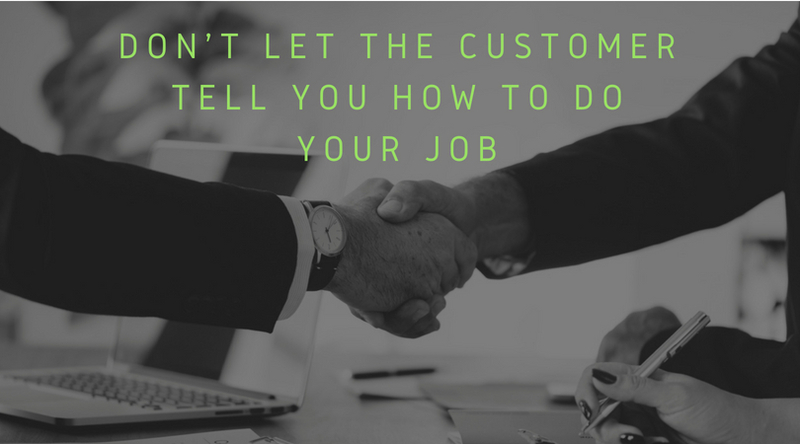 Something that I have been noticing more and more, especially in the professional service space, is too often we let the client dictate the services they need instead of giving them our recommendation. Let me explain. If someone comes to us, they know they need some sort of financial or accounting help. As a professional, we should be able to diagnose the issues they are having and provide them solutions to their issues based on our expertise and experience. Yet so many times we ask them what they think they need and just follow their lead. Why do we do this? I honestly have no idea. Here is an example to drive home my point. Let’s say you have a leak in your house and it turns out you need a new roof. When you call the roofer, is he going to ask you how he should install the new roof and what tools/materials to use? Of course not! He is going to diagnose your problem and provide you with best solution he has to offer. Professional services are no different. We know what the client needs yet we are either too scared to tell them or aren’t confident enough in our abilities to speak up. There are two things that you need to do in order to dictate the services that need to be provided. It first starts with gaining the trust of the client. If they don’t trust you are doing what is in their best interest, the relationship is going to fail. The second part is making sure your services provide value. If you tell them what they should be doing but it turns out there is no value in what you are offering, you will also fail. At the end of the day it’s your business and you should run it however you want. If someone doesn’t want to work with you on your terms, that’s okay! But you are the expert and you know what the client needs more than they do. Take the time to diagnose the issues, come up with a plan to solve the issues and communicate that to the client. I promise you will have much more enjoyable engagements and your clients will appreciate you that much more. Have a great weekend and I look forward to chatting next week!